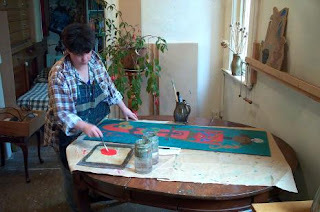 Laura's Paintings: Latest Painting: "A Love Token"
Latest Painting: "A Love Token"
Laura is currently working on "A Love Token". I asked Laura, "Where do the ideas come from?" Laura never finds it easy to put the paintings into words, but a little stream of conciousness followed, that was something like this... "Thoughts about Mermaids and Sailors, and myths about Sirens. Two worlds not able to meet, the love of the sailor for the Mermaid and the Mermaid for the sailor. Has she sunk him with her anchor? Or is the anchor something he made for her? A sailor sometimes made love tokens for his sweetheart whilst away on long voyages." Laura, your work is beautiful, imaginative, winsome and alive with color! I love it! I was hoping you lived close enough to me so that I could see your work in person, but New Zealand is a world away from my home in Arkansas, USA. I look forward to seeing more of your artwork through your blog. Thank you for your comments about my work, it was really encouraging hearing from you. I really enjoy painting and I hope to do lots more of it this year. As we slide into winter you will be hopefully enjoying spring, and it is lovely to see the photos on your blog site and hear about your gardening endeavours. Peter and I are both new to blogging. We will be adding more photos to my blog soon.